Hernias are common in early infancy and throughout childhood. Frequently I am asked to evaluate the presence of a hernia and the necessary course of action for the parent and child. Hernias occur when a loop of intestine or structures associated with the intestine protrude through the wall of muscles of the abdomen, scrotum, inguinal area and other structures. The earliest hernia most parents notice will be the umbilical hernia. The umbilical cord or remaining stump, “Belly Button”, appears to bulge outward. Sometimes, this is barely noticeable, but some hernias will protrude an inch or more and cause concern for the parents. It looks unsightly and some parents wonder if loops of bowel will be trapped inside. Very rarely will any umbilical hernia be complicated. Yet, it may persist for up to three years. No treatment is needed, although I notice some ethnic groups putting coins, straps or belts over it. These devices have the potential to cause more harm with little good. Do not try to force this umbilical hernia inward. It does not work to help heal or restore the hernia to normal. During normal development, children are bowlegged and then knocked-kneed. Special shoes or wedges make no difference. I will advise if your child’s bowlegs or knock-knees are normal conditions or if treatment is required. If the condition is normal, time is the best treatment. If your child’s condition is severe or one-sided or even runs in the family. Severe deformities will need the assessment of an orthopedic surgeon to decide if surgical correction will be necessary. Flatfeet are normal in infants and young children. The arch develops whether your child wears shoes or goes barefoot. Special wedges, inserts, or heels are not necessary for the normal toddler with flexible flatfeet. One in seven children never develops an arch. Children usually have low arches because they are loose-jointed. Their arches flatten when they are standing, and can be seen when their feet hang free or they stand on their toes. Normal children are different heights, so naturally, the height of their arches will be different. Earring pads or wedges under the arches can make children uncomfortable and probably is a waste of money in most cases. I am concerned when your child’s flatfoot is stiff, painful, or if your child has high arches. “Pigeon Toes” describes toes that point inward or outward. In-toeing is quite normal in early childhood and it is usually outgrown. There are three forms of in-toeing. The first is sometimes called hooked foot because the foot appears to be shaped like a “C”. It is caused by the position of the baby before birth. Most hooked or curved feet get better without treatment during the first year. I will examine your child’s foot to determine if it can easily be molded to a straight position. If not, I will refer your child to an orthopedist who will determine if a cast is necessary. Tibial torsion results when the normal process of leg rotation, from a confined position before birth to a more turned-out stance, is prevented by the child’s sleeping position. The tibia is the larger of the two bones between the knee and the ankle. Torsion refers to a natural twisting of the bone as your child grows. I often ask parents about the child’s sleeping position when I take your child’s medical history. 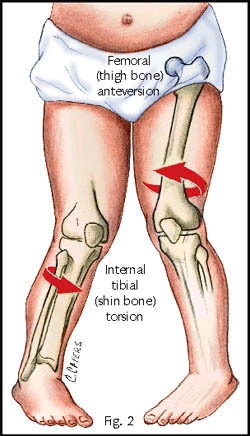 Tibial torsion usually gets better without treatment. If the torsion or twisting is severe, the twisting can be improved by forcing a change in the usual sleeping position of the feet. This can be done by tying tennis shoes with a shoe lace or sew the sleeper or PJ heels together. A splint or hard metal bar connecting the shoes can also be used. This last device was commonly used by older generations until we realized time corrected the problem without more drastic procedures. Many grandparents and older parents still tell me about their experiences. Femoral torsion is a twisting of the largest leg bone or femur. I can easily spot this when the child sits and I see the knee caps facing inward instead of straight forward. The cause of this condition is unknown, but I frequently see children with femoral torsion sit on their buttocks with their legs pointed outward and their feet pointed inward. Femoral torsion is usually most severe when the child is about 5 to 6 years of age, and fortunately, children outgrow this condition. Shoe modifications and braces do not work for femoral torsion. They can make the child uncomfortable, self-conscious, and hamper play. Complaints about growing pains are common in the 3 to 5 year old and the 8 to 12 year olds. Girls seem to be affected more than boys. Headaches, stomachaches and leg aches are common symptoms. Your child may be free of pain for days, weeks or months in between periods of pain. The complaints come at the end of the day or during the night. The pain causes cramps, creeping sensations or restless legs. There is no redness, swelling, decrease in motion of the joints, limping or local tenderness. Exams are normal — physical, X-ray and laboratory. “Growing pains” disappear after 1 to 2 years. Growing pains has nothing to do with growing since they occur at a time when the growth rate is less than in earlier years. They probably are caused by increased activity and exaggerated stretching. It has been shown that when parents help with passive leg stretching twice a day, the problem resolves itself more quickly than if no treatment is given. The is one of the common causes of knee pain. It is a pain that is vague in the knee area. There is not connection between any event or trauma. Climbing stairs or sitting for a long period aggravates or provokes the pain. Special exercises, knee bracing, and anti-inflammatory drugs might be tried. Knee pain is one of the most common complaints from young adolescent athletes. Fortunately, most of the causes for the pain are not serious and respond to conservative medical management. It is my job to ferret through the history and the exam to determine the serious and the not-so-serious. Uncommon or rare problems range from benign and malignant tumors of the bones, injuries to the hips, causing pain to radiate to the knees, or types of arthritis. More common problems involve injuries to support structures of the knees, stress injuries of the knees, and congenital malformation of the knee cap. 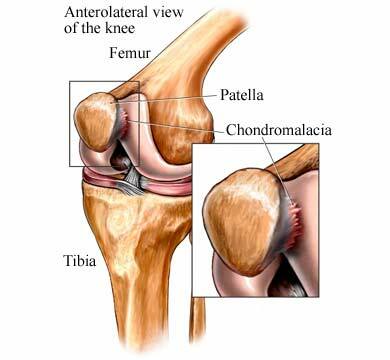 The most common injuries of the knee are “jumpers knee”, Osgood-Schlatter’s disease, and Patellofemoral syndrome. “Jumpers knee” causes pain over the center of the knee. The pain develops gradually. In most cases your adolescent won’t remember any specific injury that produced the pain. Jumper’s knee occurs in those who participate in these sports: basketball, volleyball, track and field, tennis, ballet, and long distance running. The injury can be rated from 1 to 3 severity. A grade one injury will respond to very conservative treatment. A grade three injury might require surgery. 1. Grade one is pain only after the exercise. 2. Grade two causes pain during and after the injury, but the adolescent can continue without any decrease in normal activity. 3. Grade three has pain during and after the activity, and is unable to complete the activity as before. 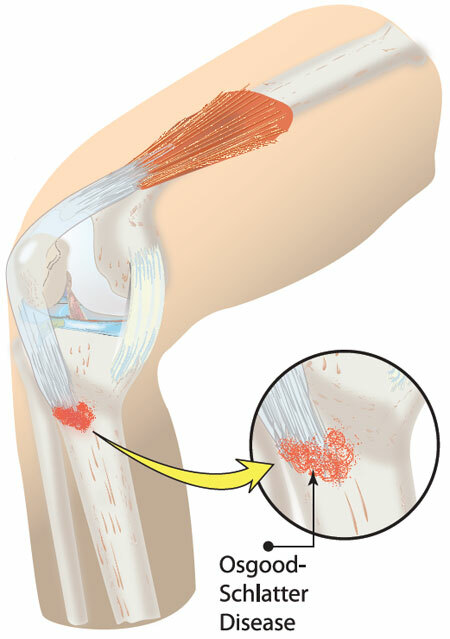 Osgood-Schlatter’s disease causes pain just below the knee-cap in an area called the tibial tuberosity. This area becomes tender and swollen. Bending the knee produces more pain. Usually rest for 6 to 8 weeks will be adequate while the tendon heals. In some adolescents the swelling persists for months and eventually might produce hardening or calcification and a hard protrusion. An elastic pad might be recommended or a brace to protect the area and restrict bending of the knee. This condition resolves completely after the adolescent’s growth spurt stops. The lateral spine sometimes curves abnormally to the side. This can cause an s-shaped curve instead of the normal straight line of the back. Most people will have one shoulder slightly higher than the other, the leaning dependent on which side is your dominant side right sided equals right handed. In a person with scoliosis one shoulder will be dramatically tipped to one side. In most cases we don’t know the cause of scoliosis. In girls scoliosis seems to predominate. Scoliosis also seems to appear more frequently in certain families. If I become aware a close family member has scoliosis (for example, the mother), I will keep a close on the children. Many parents believe that poor posture will cause permanent damage to the spine, but there is no evidence scoliosis is caused by poor posture. The exception would be in persons who have damage to the muscular system or nervous system and do not have normal muscle tone. If I detect an abnormal curve in the spine I will ask you contact an Orthopedist to measure the curvature of the spine and make recommendations for treatment. Treatment may not be necessary in some children or adolescents. I may follow them every 3 to 6 months during the faster growth periods. If there is a dramatic change a brace is indicated in certain cases. In other severe conditions, surgical bracing or repair might be necessary.